Not much time to post, but suffice it to say that things are a bit different as of the New Year. We found a new practice of doctors closer to home and so far, we are very pleased. Jade had lengthening rods placed on February 20, 2012. While the surgery itself was a success, we had a few setbacks and remained in the hospital for a few weeks. She ended up coming home with a GJ tube because of increasing reflux/vomiting post-surgery. She also had an emptying study which indicated she has very delayed emptying of stomach contents. She is now on continuous feeds via pump. It's both a curse and a blessing! Since we are new to this practice of brain docs, we felt that since she was going to be hanging out in the hospital, we might as well hook her up for an EEG. It had been a couple of years since she had one and I was curious about many of the actions she was exhibiting. I couldn't figure out if they were seizures or not. It turns out that her EEG is showing an origin of seizure activity in her right occipital lobe (explains the many "eye deviation" seizures we see) and the activity spreads immediately to the rest of her brain, causing tonic seizures. Jade underwent continuous VEEG monitoring for 4 days to ascertain whether she is a surgical candidate. Her epileptologist and the neurosurgeon both feel that a Corpus Callosotomy is the best option for surgical treatment to help prevent the spread of seizure activity. Yikes! That, obviously, is on the back burner for now since we are still trying to get back into her home routine after the spinal surgery. During her EEG monitoring, the docs stripped her cold-turkey of her Keppra, Banzel, and Clonazepam, and halved her Phenobarbitol dosages. 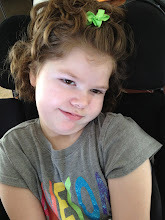 I was, of course, nervous about stopping so many meds so quickly for fear that she would bottom out with seizure activity. But, we needed to get a clearer picture of where the seizures were coming from and spreading to. Needless to say, she became much more alert and we saw many smiles in the week after the med decrease! She didn't "bottom out" as expected and it is such a relief to not have to dope her up so much. She was sent home on Depakote with instructions to slowly wean the rest of her Phenobarbitol. This particular doctor (the epileptologist) believes that if two or even three meds do not work to control seizures, than why keep adding more? I completely agree, and it is obvious it is true considering her seizures are not much different from the very first one we ever witnessed.